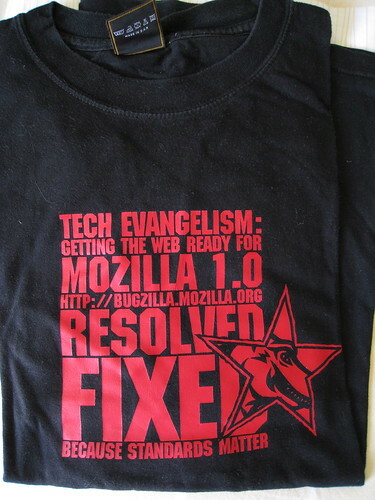 Seven years ago today, Mozilla released its first browser, Mozilla 1.0. Wired has an article to celebrate. Two years and a half later, Firefox 1.0 was released. In just the four years that we’ve been here — out of the 11 since the Mozilla project started — the web has been transformed, and has itself transformed so much of the way we live our lives. It’s easy to gloss over, since we see the changes every day — and it’s easy to see the road that we’ve traveled on as being inevitable — but it really wasn’t. The reason we have a vibrant, open web today is because of millions of little decisions and contributions made by thousands of people in that timeframe — people who work on browsers, people who build web sites & applications, people who evangelize for standards, people who use the web and ask/demand that it be better. If you happen to read my blog, there are good chances that you are one of these people who have contributed to this changes with your "little decisions and contributions", such as using Firefox, installing it on your friends' computers and making sure your Website is compatible with modern browsers. I would like to thank you for this. But I'd like to reiterate the fact that this is just the beginning of the Web. Most of it remains to be invented. Let's make sure that we keep making these little decisions and contributions coming, so that the Web we're going to use tomorrow is the one we want! Glyn Moody: Happy Birthday, Mozilla - and Thanks for Being Here. Pretty good read, with mentions of JWZ's Nomo zilla article. Hat tip goes to Frank Hecker for mentioning this. Rooooohhhhh, je l'ai encore ce T-shirt ! Le T-shirt est aussi chargé que l'interface de la suite Mozilla.